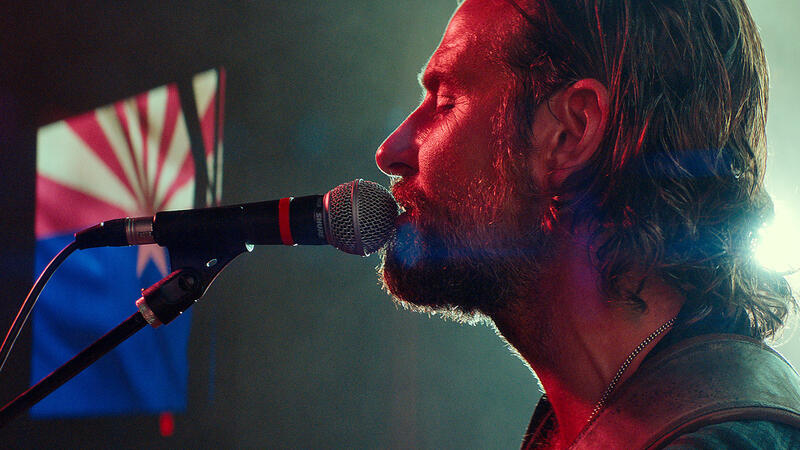 Bradley Cooper plays musician Jackson Maine in A Star Is Born. In addition to playing the male protagonist, Cooper is making his directorial debut. 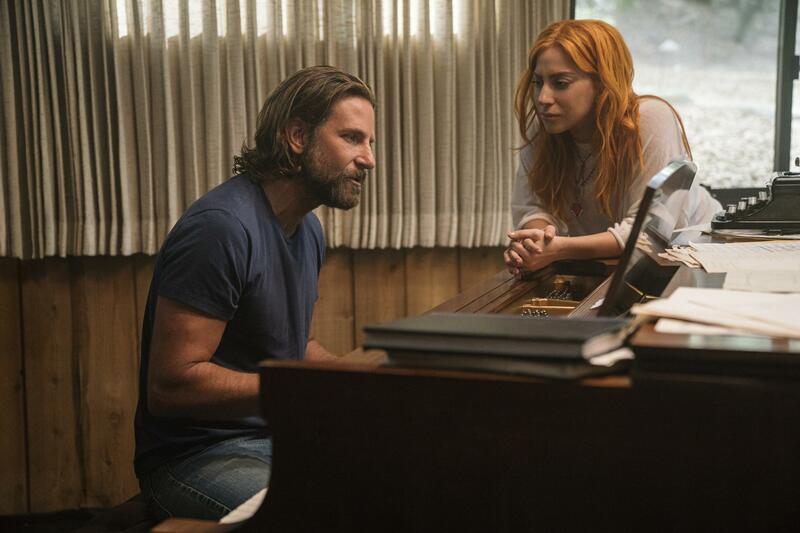 Lady Gaga was cast as Ally, the up-and-coming musician encouraged by Bradley Cooper's character. For Cooper, it's not only a story with personal resonance — it's made more challenging by the fact that Cooper is playing a musician, a guy named Jackson Maine, opposite the character Ally, played by Lady Gaga. I knew nothing about her. I didn't even know, really, what she looked like before I met her. And I was — I couldn't believe how comfortable she made me feel, and how present she was — is. And then we went to the piano and sang, and it was this kind of wonderful thing. I couldn't believe it. So that was the beginning of the journey. And the first time we sang together — everything's live; we sing everything live in the movie — oh yeah, there's nothing, we're not lip-synching. And I turned to Lady Gaga, who was singing next to me, and she was looking at me like I was Jackson Maine. And when you're in a scene, and the actor is fully believing that you're the character, you can't not believe it yourself. So she really gave me that confidence. Martin: You're talking about alcoholism, because this character is a big drinker. Cooper: And addiction in general. And the main thing, when I was writing it and specifically shooting it, I thought: Gosh, when this movie comes out (if it does come out), I really want anybody who knows deeply about this disease to say, "Yeah, this is the reflection of what it's like." Not a glossy version, but the real reality of what it is to be an addict. With this property, there are many writers that come before — if you see the end credits, it's like, there's 10 writers. And [Jon Peters] was part of the, I guess, the grandfather clause of the movie, and we had to get his consent in order to make the movie. When you're at the helm, it's a huge responsibility. And I guess — I mean, first of all, on the set ... you have to create an environment where everybody feels safe. Everybody. And there's no room for disrespect, nothing. And that's something that you'd have to ask everybody who was involved, but I feel like that's the environment I created. Luckily, Jon wasn't there. And if I had known all those things, I would have done it differently. And I guess it's ... I wanted to make the movie, I knew I had to get consent from him, otherwise there's no film. But I should have checked. I guess that's the thing. Well, I've been opened up to a world of children's music, that's for sure. ... I spent about 15 years going from movie to movie to movie. And then I hit 39 and I stopped and I said, "What do I really want to do?" I want to tell Joseph Merrick's story in The Elephant Man. So I did that for a year. Then this story came to me, A Star Is Born, and then I spent the next four years doing that. And the one thing that I know in the future is: It's worth all the time to dedicate, even if one piece of art comes out of it in a half a decade, that would still be incredible as long as I can feel like it's the movie I wanted to make, which is this movie. So I guess having a child, and having a family of my own — which is a miracle and something I've always dreamt of — has opened me up even more, I guess, to the day, and to be present. Here's the other thing that connected Stefani [Germanotta, Lady Gaga's given name] and myself right away, is that we were very, very loved as children. And when I meet people that have had that similar upbringing, I can just see it in them. And that's the thing I want my daughter to have — I just always want her to feel loved. Noor Wazwaz and Danny Hajek produced and edited this interview for broadcast. Patrick Jarenwattananon adapted it for the Web. [POST-BROADCAST CORRECTION: We say the Producers Guild of America had said Jon Peters would no longer be recognized as a producer on A Star Is Born. The PGA does not have any say in who is listed as a producer in credits. It simply confers its Producers Mark on people it believes to have performed a majority of producing duties on a film. The PGA has confirmed it will not be giving Peters the Producers Mark.] Transcript provided by NPR, Copyright NPR.